Home > AMT Blog > “Home for the Holidays” – Christmas Returns to AMT! “Home for the Holidays” – Christmas Returns to AMT! It’s hard to believe, but in just a few short weeks the curtain will rise on The 2012 Christmas Show: Home for the Holidays. Andrea McCormick, AMT’s Artistic Director, and her staff have been working hard all summer to create an all-new Christmas show that’s sure to delight guests of all ages. Andrea has been busy for months conceiving, writing and choreographing the show which opens Thursday, November 1. This year’s holiday extravaganza centers around the idea of making our way “home” for the holidays to celebrate with family and friends. Wonderful musical arrangements of classic and contemporary holiday songs will be sung by many returning AMT cast favorites. In addition to the elegant scenery and beautiful costumes, there should be plenty of fun included. Children will love the world of pure sugar and candy in Santa’s Candy Factory. We don’t want to give away too many show surprises … they’re best enjoyed in person, anyway! 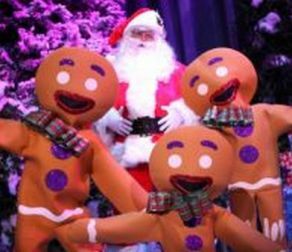 So, make a date with your family and friends to experience one of Lancaster County’s best-loved seasonal shows. The 2012 Christmas Show: Home for the Holidays runs November 1 through December 30, with morning, matinee and evening performances available. Click here to purchase tickets. We look forward to seeing you soon!